Sure. I was writing this for myself, decided others might like it. I am not profiting off of any of it, now or ever. And I think you're doing a great job. I just downloaded the latest version and will be testing it. Thanks! and now, I'm theming the app... Trying to stay somewhat to Google's Material Design guidelines, as much as possible. Cool. I was going to ask you about what icon you were going to use for it. So far it has been working well for me. I actually installed on my Nexus 7 to have the larger screen. Looking forward to more. Well done so far. After much work, I finally came up with an icon design that doesn't look hokey, hammy, or cheeesy... Actually, I have two of them. 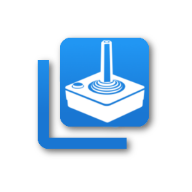 The outer border comes from the Google Material symbol for "Library", the inner is a toss up between the Google Material symbol for Game Pad, or an Atari CX40 joystick. Thoughts? I'm leaning towards #2. Good, identifiable icons are _VERY_ hard to pull off, and this was whiddled down from many more, which sapped all my energy. 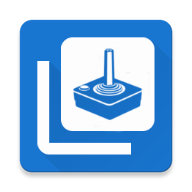 Hello, everybody, I am here to formally announce the beta release of the Atari 2600 Manual Database for Android Devices. * Easily view over 300 Atari 2600 game manuals, in a very intuitive, gestural manner, complete with pinch zoom, and pan features. * Title search for manual titles. * completely self contained, no Internet connection needed, after install. * Works on any Android device running Android 4.0.3 or later. More features are coming, but I wanted to get this out, so that everyone could use and comment on it. One bug I know for sure, is that the About action in the Options menu can't be seen (white on white text), I am trying to track down the problem. Credit and thanks to everyone who originally scanned and collated the manual data over the years for the benefit of the community, is expressed in the About activity of the app. Icon 2 by far, btw. Edited by Rom Hunter, Sat Aug 13, 2016 2:52 PM. If any of you have a manual that I do not have in the collection, please get in contact with me, and we'll work out putting it in. It should build with a standard Android Studio (SDK) installation. If anyone has any questions about the data format, or adapting this for other platforms, please ask. Don't be disappointed! Maybe most people didn't have seen it so far (as me). I have looked the video and also think it's very useful! Badly I don't have an Android device. So is there something similar on the web? Edited by MacrosCode, Sat Sep 3, 2016 7:32 AM. I have enjoyed using this. 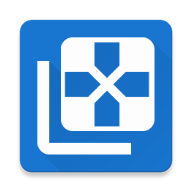 It is very nicely put together and I love using it on my Nexus 7! Icon #2 I think works the best for it also. The Atari joystick works best. Atari Age also has a database of manuals for many of the 2600 games. You can probably ask to use any that are available here that you don't have in your collection. It is well done and useful. I have it installed on an LG 8-inch tablet running Marshmallow AOSP and it works very well. It might be worthwhile to consider unbundling the manual content as a separate download (the app can check for it and download at startup). Doing so would make shipping updates to the app itself much easier, since you wouldn't have to download a 500-megabyte payload repeatedly. And, it would open the door for downloads of manual packs for other systems, such as Intelivision, 5200, Colecovision, etc etc. That will take some changes to the app (as I am explicitly including the manual contents as resources, and using the built in OS resource management to help keep the memory consumption down), but I am definitely considering it. Just installed and got the "That's neat" from the lady so it's a double like from me! This sounds like a good idea. There are quite a few apps (many of them, games) that do this. I'm looking forward to checking this out!....waiting for it to finish downloading. I tried to make as many of the titles able to be entered from the voice keyboard, as possible...will improve it. You can make as many front-facing activities as you like, and assign each of them an icon resource in the app manifest file. Thus, one app can have several launch icons in the system app drawer. You can even dynamically add launcher icons, but it's a little more involved and usually requires the user to restart the device (or restart the home launcher) to see them. This may have gotten more flexible, it's been a while since I've developed for Android. I don't have a good solution for unbundling the content that is as convenient as using the platform resource compiler. I worked on an app that had a huge payload of sampled sounds; it downloaded them from Amazon S3 as a .zip on initial startup, then unpacked the zip file into a folder on external storage. The list of files was precompiled into the app; if you took a similar approach you would likely want to consider a SQLlite database as part of the download which provides a manifest for all the content given. If any of this sounds appealing to you, I have the download/unpack code that I wrote here: https://github.com/m...f/ZipDownloader There's probably better solutions out there for doing this sort of thing now. Edited by FifthPlayer, Wed Sep 7, 2016 9:10 AM. Does anyone object to having the program ask for permission to use the camera, so that high-score pictures can be taken? Not at all. That would be a cool feature. This thing is nuts. I can't thank you enough for creating this. SO awesome. For anyone trying to install this on an Android phone, even if you allow outside apps to install you may not see this in your Download folder. I know I didn't. However, I downloaded ES File Explorer and within that app I navigated to my Download folder and saw the APK, and installed it, just fine. Thank you. Having made this has made all the wonderful 2600 games playable. Great example, being Championship Soccer... Game 1 is such a dreadful variation of the game, but go to Game 46, and you have a 1 player, against computer, that is fast, and has no out of bounds, and a large goal, so that you can have a nice fast paced, and competitive game...but I would never have found it, IF I DIDN'T HAVE THE MANUAL.